﻿ The Apartments at Merdeka Palace Hotel, Kuching | FROM $49 - SAVE ON AGODA! "Spent quality family time here." 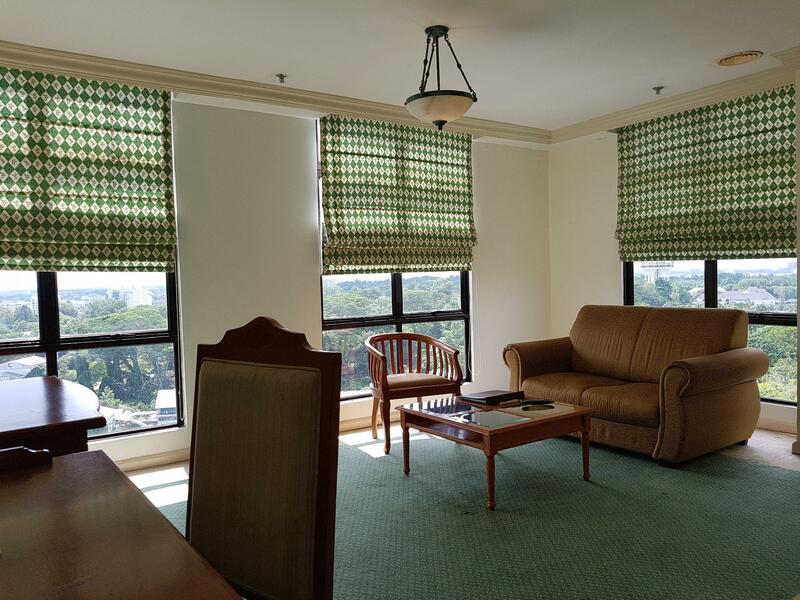 Have a question for The Apartments at Merdeka Palace Hotel? "Pros: Cheap, affordable, nice view, location, facilities (i.e. swimming pool, gym), nice bathroom, friendly staff." "Strategic location to access to city centre." "The apartment is good unlike the hotel rooms"
Centrally located, the regal The Apartments at Merdeka Palace Hotel gives guests privileged access to some of Kuching’s historical jewels, including the Sarawak Museum and Padang Merdeka. The hotel is just a five-minute walk to the Plaza Merdeka and a 10-minute walk to the Main Bazzar – famed for its souvenir shops – and the city center along with other attractions. The Apartments at Merdeka Palace Hotel features 213 rooms inclusive of apartment suites. The hotel offers comprehensive facilities that include access to Wi-Fi, a health center, gym, swimming pool, and sauna, ensuring a pleasure stay for guests. The hotel has six international standard food and beverage outlets. For these reasons, guests are welcome to stay at the The Apartments at Merdeka Palace Hotel for an unforgettable experience. 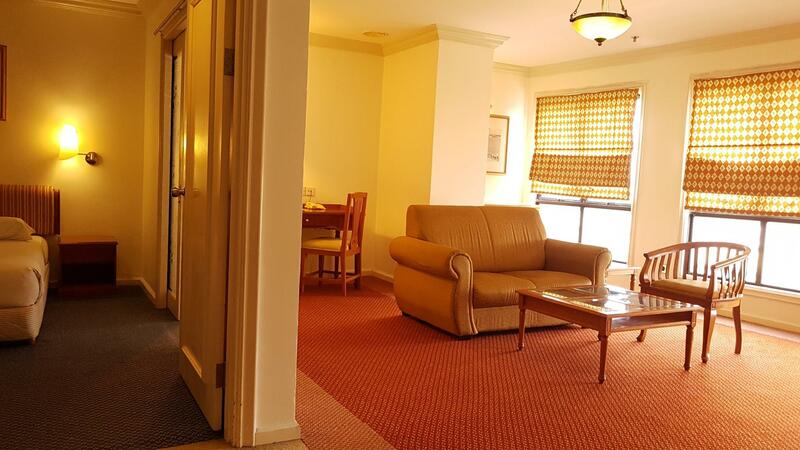 Its was a great room with nice staff and the first impression is a wow for me. just they need to do some refurbishment on some items such as the TV(its so vintage) as the TV is not up to what we use to see TV nowdays plus the wifi also need to look at because during my stay the connection is poor and often disconnect so i hope next time i go here, all this can be resolved. This hotel is quite old, but clean and comfortable. The location is strategic that all the Kuching attractions were walking distance. The location is nearby all point of interest that we wish to taste and experience, just by walking distance. The staff in hotel apartment is friendly and considerate especially we have young children travel with us, the check in and check out process handled professionally and fast. Helpful in term of request made by us they response fast. Facilities might look aged but well maintained, good job. Will consider again for next Kuching visit. It was a pleasant stay for me, my parents and my 2 sisters. The place located at center of the city and just next to Sarawak Museum and a shopping mall. Easy to find food where the hawker/restaurant you can find them easily. The ambiance of hotel was peaceful, I love when backed to the hotel about 7pm, you can hear the live piano played by someone who is very talented. Overall, I enjoy my stay there. The only improvement needed is the swimming pool. The cleanliness can be improved because I found the water in the pool was not really clean(found black dirt in the water). Very central location and close to a lot of attractions.Restsurants and shops within wslking distance. The hotel is value for money but my room only available around 5.30 p.m. No apologies or any words from the staff. The only good thing about the place is the location. The rest about the place is bad. Not worth paying if the place is not clean, amenities not funtioning well, facilities are in bad condition and staff are not helpful & friendly. The place needs a lot of renovation and upgrading to do. overall my stay was good but the only things that have to wait for almost 1 hour to get a room. comfortable and the location very strategic but hope to provide small towel in front of bathroom.